Funeral Hymn Sheets for funerals might include prelude music, an opening hymn, special musical selections, a closing hymn, and postlude music. Simple hymns and other songs with gospel messages are most appropriate for these occasions. Opening and closing hymns are usually sung by the congregation. "When Only the Best Will Do" farewell your loved one with our high-quality hymn booklets that will become a remembrance keepsake. Bring us your hymns, images of your loved one, we will customise a memorable Hymn Book for the family. Sometimes referred to a memorial book or a hymn book. 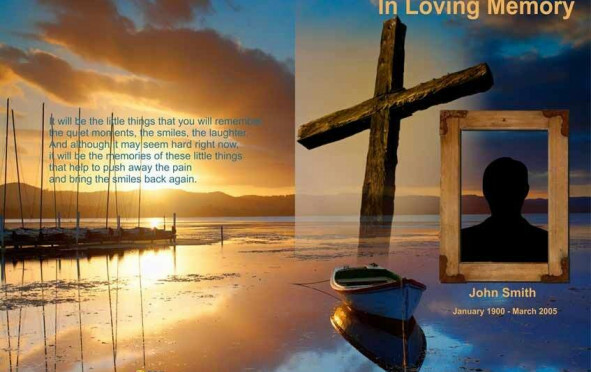 We also supply mass cards for deceased Australia and holy cards for funerals. The cover normally has the deceased's name, the date of birth and date of death. The cover also is the place for a photograph, the venue and the date and time of the funeral. Inside is the order of the service/ceremony. There is not usually room for all the words of readings, so put the title or the biblical reference. Other information, often on the back cover is the address of the reception and the charity to which donations are requested. Sometimes referred to as a memorial book and an order of service Catholic funeral. Internal pages printed on quality 150GSM art paper. Booklet covers, select from a choice of 250GSM or 350GSM artboard stock finishing with gloss or matt lamination.